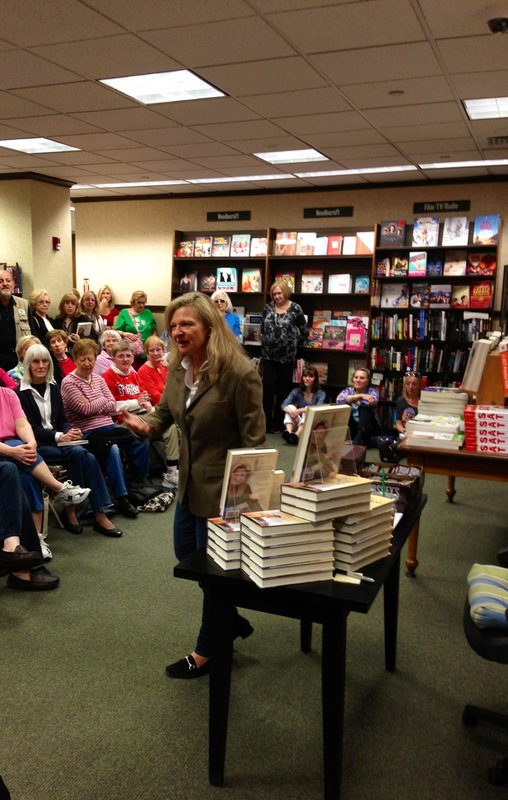 Today Lisa Scottoline’s new novel, Don’t Go, came out and she’s started her book tour to support it. In the morning she was on Fox 29 speaking about the novel, and her first book signing was at Barnes & Noble on Rittenhouse Square in Philadelphia, PA. While I woke up today feeling lousy, I planned on going to the signing for months. It was a beautiful day in the City of Brotherly Love, so I sucked it up and went to the book store. Like last year, I took the escalators to the third floor where the signings take place. I walked in with 10 minutes to spare and was greeted by a room full of people and limited seating. But I made the most of the situation and stood off in the corner, eagerly awaiting Lisa’s arrival. 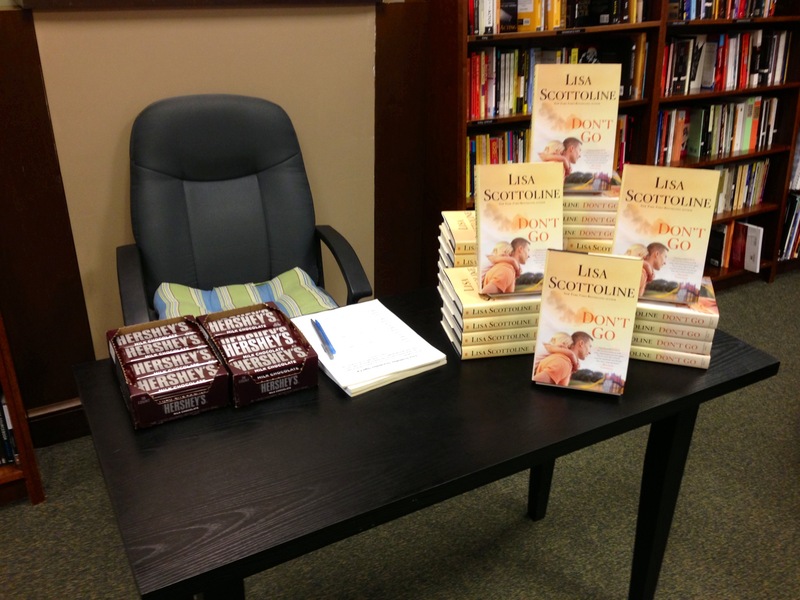 I also noticed the table displaying the new book and a couple boxes of Hershey’s chocolate bars. Last year Lisa gave out Tastykakes, but this year she had trouble acquiring them, so she opted for another traditional Pennsylvania sweet. After being introduced, Lisa was met with a warm round of applause. She quickly launched into funny stories about everything from a recent pap smear to her ex-husbands. She had the crowd in stitches the entire time with her honest, unfiltered humor. Then, Lisa started talking about the inspiration for the book and how it all started with a visit to her podiatrist. She explained that while podiatry may not be the most prestigious specialty, overseas, in the middle of a war, “these men are gods.” Lisa wanted to tell the story of those serving at the end of a war and the issues they encounter, as well as what it means to be a man and a father. She described these standalone books as “family stories” featuring crime, and her Rosato & Associates books as crime stories featuring families. Speaking of which, her newest Rosato & Associates novel, Accused, is coming out in October. Then Lisa started signing books and meeting with fans. Many of the fans she knew from previous signings, and one fan said meeting Lisa was a dream come true and that her books helped her get through a period in her life when she had to have an operation on her legs. 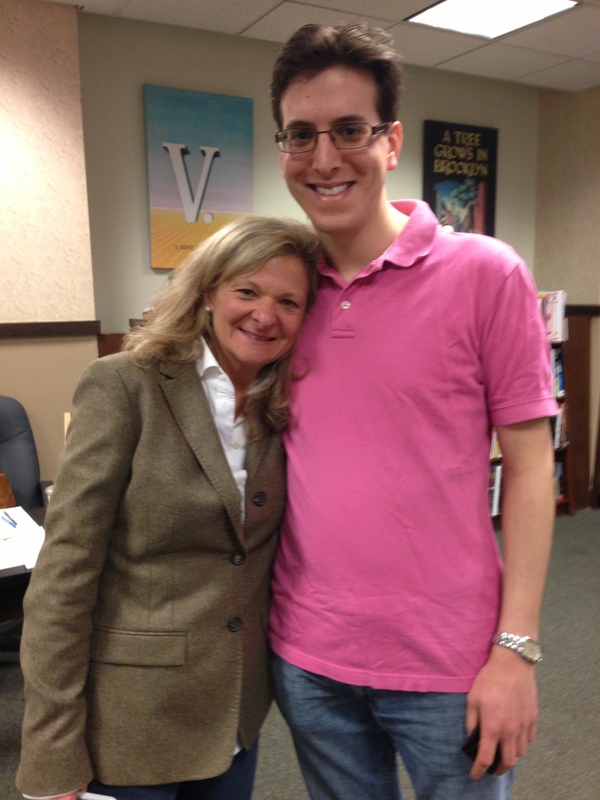 When I got to the front of the line I thanked Lisa for allowing me to interview her a few weeks back, and she complimented me on my Don’t Go book review. I told her that my girlfriend was a little jealous about her referring to me as “sweetie” and including “xoxoxoxo” in our correspondence. Lisa laughed and said, “Well you are a sweetie. Tell your girlfriend we’re keeping it clean.” She ended by offering to support my writing however she can, and I was touched. 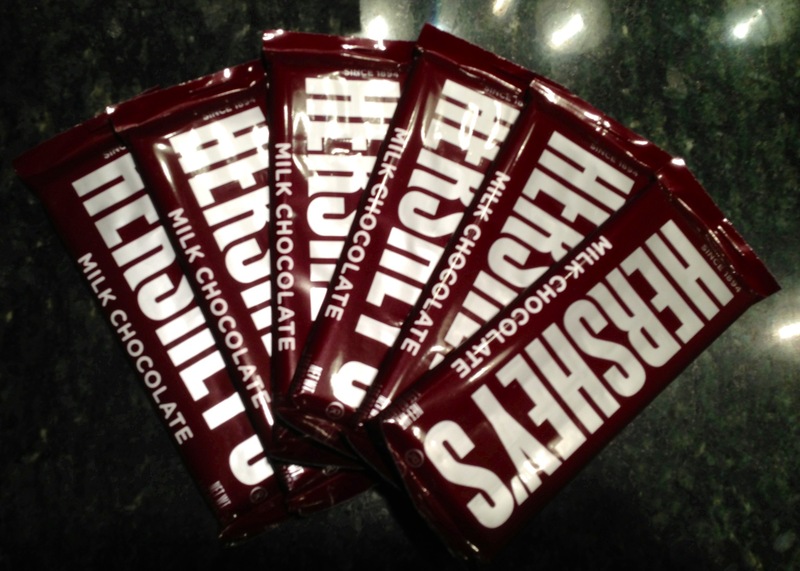 She also gave me six Hershey’s chocolate bars before I left. As I’ve said before, Lisa’s a genuine and generous person. Buy a copy of Don’t Go, and make sure to go see her if she’s in your area during any of her appearances.